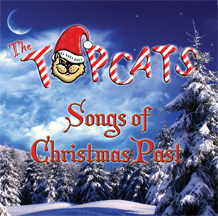 On November 21tst, 2014 The Topcats released “Songs of Christmas Past”, a collection of sixteen songs recorded by The Topcats over the past three decades! All of these songs were released at some point in time but were spread out over various releases, many of which had limited exposure and were not available to most people. 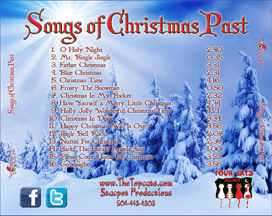 The sixteen songs are “O Holy Night”, “Mr. 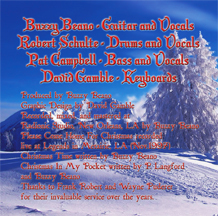 Bingle Jingle”, “Father Christmas”, “Blue Christmas”, “Christmas Time”, “Frosty The Snowman”, “Christmas In My Pocket”, “Have Yourself a Merry Little Christmas”, “Holly Jolly Wonderful Christmas Time”, “Christmas In Dixie”, “Happy Christmas (War Is Over)”, “Jingle Bell Rock”, “Nuttin’ For Christmas”, “Hark! The Herald Angels Sing”, “Please Come Home For Christmas”, and “Goodnight”. Check out the songs below from the CD!